One 3-ounce serving of seared steak tips provides anywhere from 210 to 230 total calories. Between 45 percent and 60 percent of the calories are from protein, and in most cases, the remaining calories are from fat. Sometimes, however, experimenting with other ingredients during preparation can add a few extra calories from carbohydrates. You'll get 19 to 23 grams of protein from your meaty dish, giving you 76 to 92 calories from protein per 3-ounce portion. The same amount of cooked steak tips contains roughly 12 to 14.5 grams of fat, amounting to 108 to 131 calories. 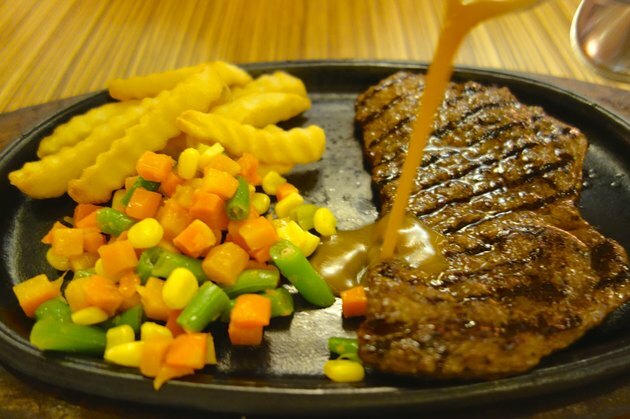 Plain steak tips do not contain carbohydrates. If they're marinated, though, you could get about 4.5 grams of carbohydrates, which is 18 calories from carbs. Additionally, pouring just 1 teaspoon of oil onto the pan packs on another 40 calories.